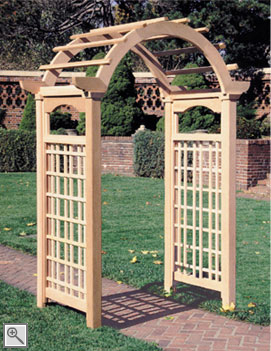 This arbor, reminiscent of classical style architecture, is a full 36" deep and is constructed using 4" x 4" posts with traditional style caps. It employs sturdy lattice side panels of ¾" x 1" mahogany. 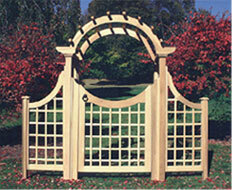 Available with or without the lattice extensions and the Moon Gate, as shown here, or with any of our other gate styles, as referenced in the Arbor Gates and Extensions section. The opening for this arbor may be customized to any size up to 5'. 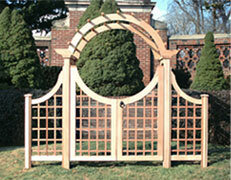 A Double Moon Gate, shown below, may be used with the 5' arbor.